This event was a spectacular happening. Marionette, her crew and guests were participants and thoroughly enjoyed every one of the 4 days. We have a super DVD that I need to figure out how to link in to this site. The kick off was a visit to the S&S offices in NYC, followed by a reception at the New York Yacht Club. Concours d’ Elegance Judging 12PM – 4PM; S&S Association Cocktails (for Association Members); Sparkman & Stephens Anniversary Gala Dinner 6:30PM. The Concours d'Elegance was a competition (really more like an arms race) in several categories for best restored yachts. 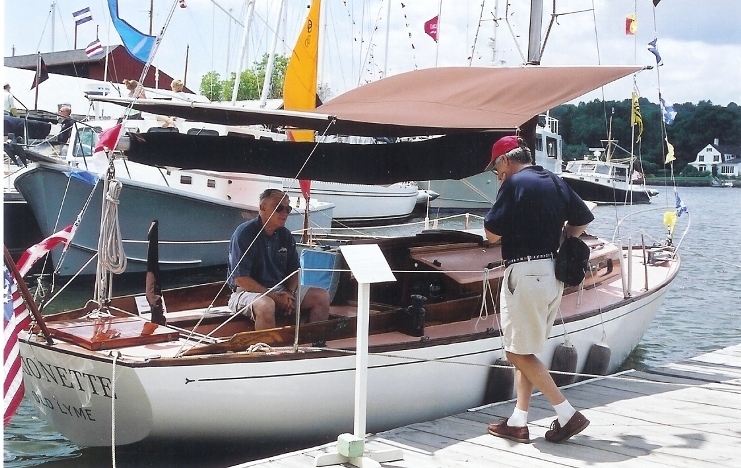 Elizabeth Meyer of International Yacht Restoration School (IYRS) and author John Rousmaniere, were the judges, but Olin himself spent a lot of time looking at the boats. There were some absolutely incredible yachts present and many owners who had more or less blank checks in this game. Marionette being boarded by IYRS' Elizabeth Meyer and John Rousmaniere. Your webmaster had high hopes for some silver at the awards ceremony. The dinner was an elegant affair and had center piece photos of famous S&S designs - including, of course, the Dolphin 24. Mike Gooch-Breault (Passage, Marscot/O'Day Hull #10) exchanging Dolphin notes with the Designer. The final event was a rendezvous with the International Yacht Restoration Classic Yacht Cruise at Fishers Island's West Harbor at 5PM on Sunday. 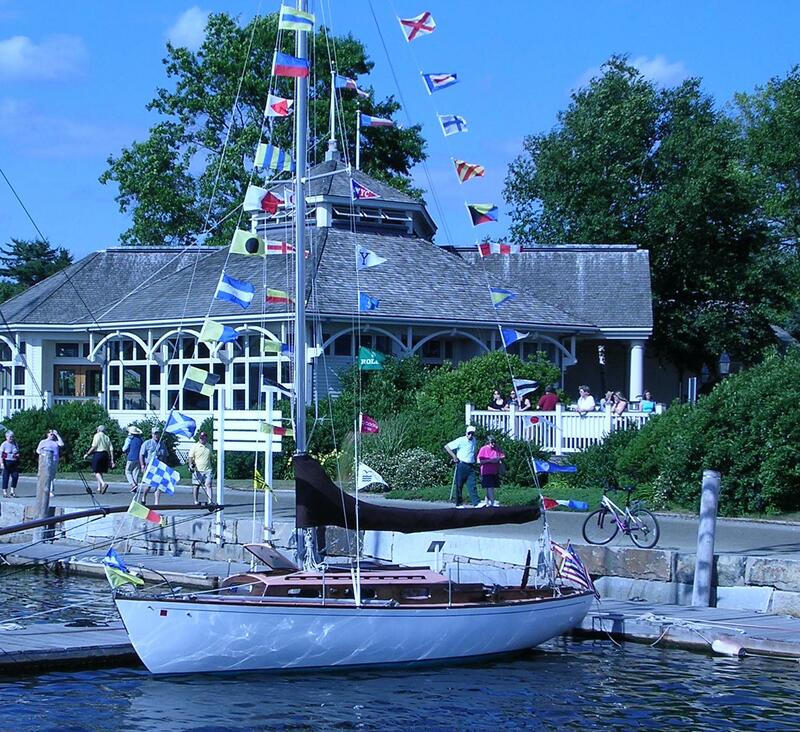 The S&S fleet of some 50 classic yachts, after a short delay because of a swinging bridge problem, left Mystic Seaport just after Noon in a parade down the Mystic River. Among Marionette's crew were Herve and Marie Elias from Plouguiel/Treguier, Brittany, France. Herve was named the S&S Secretary for France (and he and Marie hosted the S&S Annual General Meeting in France in 2006). For more interesting tidbits about Herve click here, and see below. Lunch was served aboard Marionette. 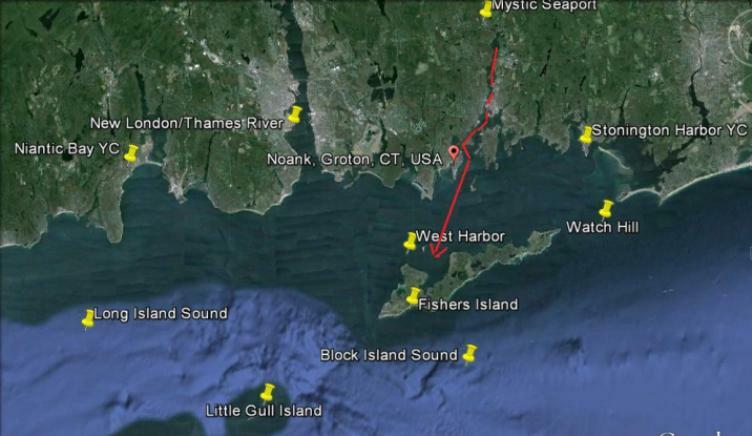 It was a soft and easy sail down the Mystic River and across Fishers Island Sound to West Harbor. We had clear skies and a couple of hours later we put the hook down in the outer harbor at West Harbor. The fleet anchored off the north shore of the outer harbor and launches from the IYRS raft picked up guests at their boats. The host yachts were raft anchored in a broad arc with 3 extraordinary beautiful motor yachts at the center set up to serve endless glasses of champagne. The landing/unloading area was inside the arc of rafted boats with their gleaming brass and varnished taff rails - a very well organized and impressive entrance for guests. S&S guests were to bring their 'favorite' hors-d'oeuvres with recipes. 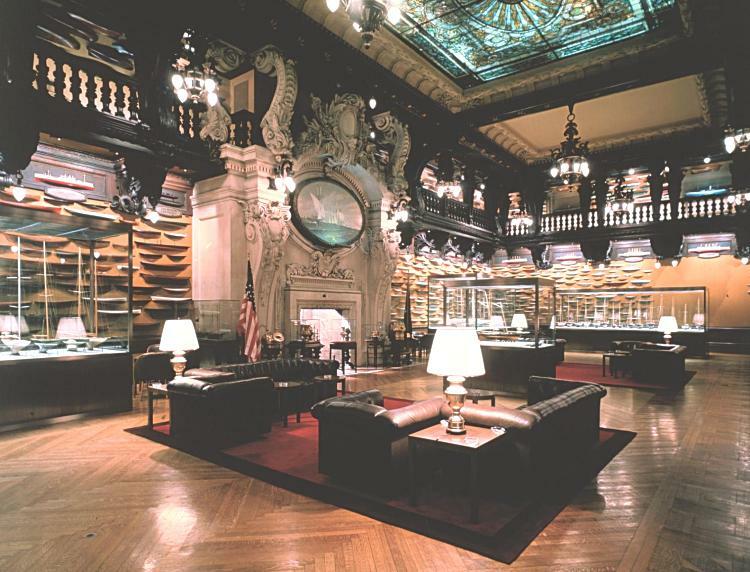 Sparkman & Stephens, the pre-eminent name in Yacht Design is celebrating its 75th Anniversary. 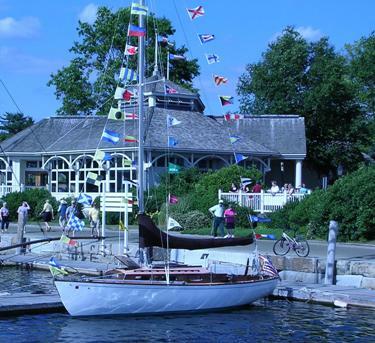 Mystic Seaport Museum will be the location for a 75th Anniversary Gala Dinner and Concours de `Elegance. Over 50 of the finest yachts that reflect the very best inventory of the current and past designs of Sparkman & Stephens will be on display. 700 people are expected at the Gala Dinner. Olin Stephens and several of the premier yacht builders that have brought S&S Designs to form will be on hand and speaking of their storied partnership. 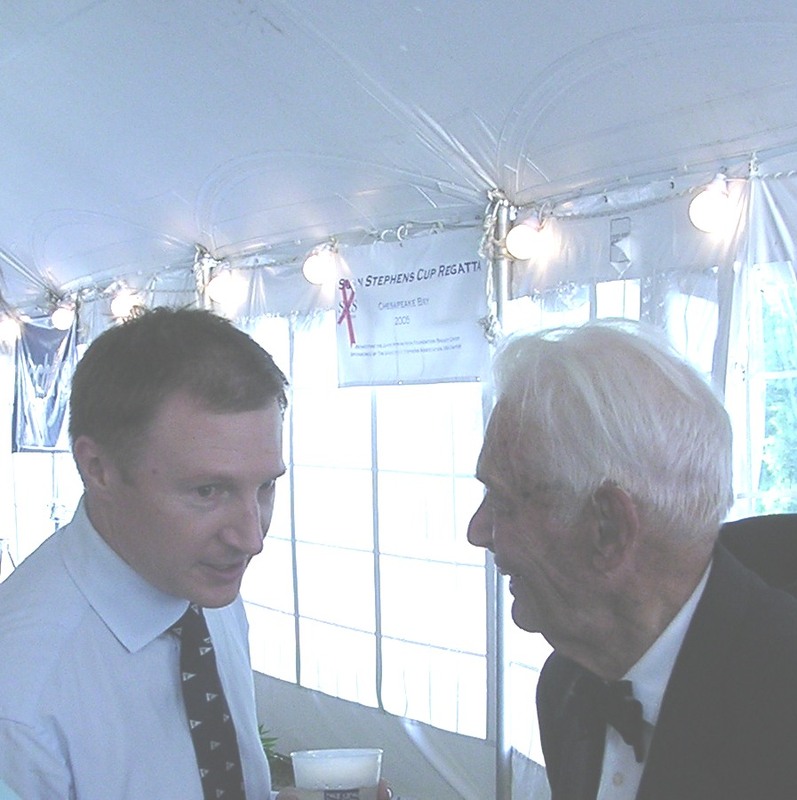 The event will also be the site of the 2004 Sparkman & Stephens Association Annual General Meeting. Over 100 members are expected to attend. May 9, 2014. We recently received our copy of the 2014 edition of the S&S Member's Yearbook. This year, 2014, is their 85th anniversary and they chose an article by Herve Elias written in French for Chasse Maree (Paris) Magazine in February, 2005. It was 8 pages long detailing the 75th anniversary events. Click here to see the translated version.